On Thursday, President Abdulla Yameen spoke about hate speech and the limits of freedom of expression. 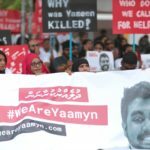 The remarks were widely seen as a reference to the murder of liberal blogger Yameen Rasheed. 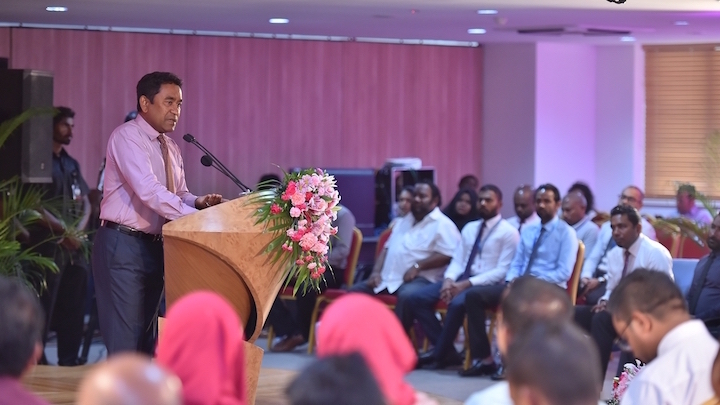 In a speech delivered at a ruling party event on Thursday, President Abdulla Yameen spoke about hate speech and the limits of freedom of expression. 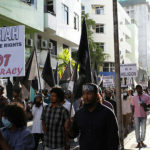 The remarks were widely seen as a reference to the murder of liberal blogger Yameen Rasheed, who has been accused of apostasy and insulting Islam by ruling party members and religious figures. The following is an extract from the president’s speech. Take a look at today’s social media, how much talk is circulating. But then take a look at how these things are in the most developed countries of the world. Among the most developed countries in the world, for example in Germany, among the actions against social media and people who host various media site, if they spread hate messages or dangerous stories, they have decided to impose fines of up to 50 million Euros. So is the Maldives the only country without democracy? Insulting religion through freedom of expression, who is going to accept this? 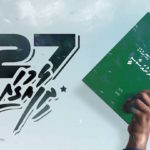 For a certainty, under this Maldivian state, this government does not believe that a person can write to insult religion in any way they want, on any medium they want, under freedom of expression. These are similar things, ok? As I said another night as well, a terrorist is not by any means someone who blows up a place. However, when someone keeps writing and writing, spreading and spreading hate messages, to create a bad image among the public of an innocent person, and it reaches the point where the rest of the public or a majority of the public believe that he is a fearsome and dangerous person, then there might be those who would dare to do anything to that person. So what happens? An innocent person, an innocent person is portrayed as an evil person whom others fear. And when the person is portrayed that way, when he meets his fate, in truth he ends up becoming prey to some merciless and cruel group, isn’t this so? This is how it is among us. So action is taken against hate messages elsewhere in the world, too. Action is being taken against people who manage Twitter handles. So in the Maldives, if we want our whole society to remain safe, we will have media freedom and freedom of expression for citizens even if, as I said, you don’t talk insulting religion. And as I said, even if you can’t send hate messages, that doesn’t place any obstacle to the people’s freedom. Is the people’s freedom obstructed when you talk and talk and write questioning the oneness of Allah? Does that obstruct freedom? We don’t have to accept these things. 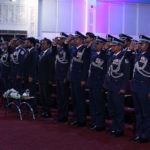 The president also spoke about the murder at an event of the Maldives National Defence Force on Sunday night last week. As we celebrate the 150th anniversary of the strongest defence force of the state, as we hold this ceremony tonight, this morning’s dawn came with shock and distress for this institution and the whole Maldives. Even if unrest has not spread in our society, every crime, every atrocity like this shocks us. Today, we saw that a blogger, a journalist was slain and his life ripped from his body. Without a doubt, this is something that all Maldivians, without a doubt, the Maldivian state, all of us condemn. However, from this also, we have to think about how weak we are. How defenceless we are. The reason our institutions must apologise for the lack of guarantee of safety and security as an individual and from the environment we live in. This is a living example. However, I will not point the finger of blame on any institution, because the institutions are blameless. From about 10 years back, the turbulent waves of unrest have spread throughout the Maldives. Why don’t we talk about this in political platforms? The easiest thing to do is to point the finger of blame at the people who are supposed to do things, who are supposed to be watchful. However, if from the very front lines, we worked for peace and harmony and if we believed that the Maldives is more powerful and heavier than any of our individual interests, we would not be facing this. All our political leaders condemn this. We all condemn today’s cruel act. What we can do is investigate. When we talk about investigations, we have to think about the cases that have been investigated but have not been completely solved. That is something that the government regrets. However, this defect is not something that only the Maldives faces from the whole world. There are cases that have not be solved in the world. 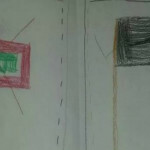 However, considering the small population of the Maldives and the knowledge we have of each other and friendly nature, most people will believe that these cases should be solved. If we go back to October 2012, what did we meet back then? Back then we were met with how the brutal killers of Afraasheem cruelly slaughtered and fell his body to the ground. We are seeing the same. In his own home, near the stairwell, Yameen Rasheed’s body was slaughtered and fell. There were so many stab wounds on both bodies. Back then also investigations were conducted. Even that case [Afraasheem’s murder] has not been solved yet. Today. the sad thing is that people who were given responsibilities, keep saying on public platforms that there are people who know the truth of this. They keep saying that they will reveal things when the time is right. When will the time be right? I can’t imagine when the time will be right. If you want to stop something, the right time is to share the information with investigating authorities as soon as possible. However, that responsibility was not carried out. While that responsibility was neglected, the blame falls on someone else’s shoulders. This is disappointing. The truths behind these murders have to be reached. After that, we saw that [abducted Maldives Independent journalist Ahmed] Rilwan, in the same heartbreaking manner, was lost without a trace. The state is doing countless work. The police investigative units are working hard. However, in this case also, we are unable to reach the truth. Due to lack of resources even. We have employed foreign resources in this too. And after that, in a dangerous incident, when the President’s speedboat exploded, we faced dangerous things. 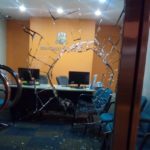 Even though with the abundant blessings of Allah there was not much damage or injury, the things about this case are also not clear. We know who planned the evilest plans. Evil people will always plan things. However, Allah’s plans are far better. Allah knows things better. What do I have to say today as the president? Even today, as the president, I repeatedly reiterate, I repeatedly state, I will implement the death penalty. Today, this shows the importance of implementing the death penalty. How many political leaders and how many senior statesmen have all opposed this? So from the neglected behaviours and when we neglected the tearing of the social fabric of the Maldives and other things that we neglected, now we are experiencing the heartbreaking results. From the things that we have to do now, the execution chamber has been built. Today, the home minister gave me the confirmation that all the gadgets needed for this will be arranged in the next two to three months. My message to all the cruel criminals is that the law will reach you. With the will of God, after the investigations when the murderers are found they will face their rightful punishment. That is my message, even today, to the Maldivian people. You can criticise us over this. We will be patient. Why is that? Because we, like all Maldivians, have the same individual rights, but we have responsibilities far greater on our shoulders. This is why we have to talk about this. The president’s office also issued a statement in response to the murder. The Government of the Republic of Maldives, in the strongest possible terms, condemns the murder of Yameen Rasheed. In his death we have lost a young, energetic, voice full of potential that contributed heavily, and responsibly, to the social and political discourse of our nation. He was a socially conscious, civic minded, talented, creative, courageous and impassioned young soul – everything the youth of this nation should aspire to be and more. He will always be recognised as a proponent of change; especially, but not just limited to, his active, and iridescent, presence on social media and his more recent work on an app to drive and sustain blood donations. Yameen was passionate in harnessing technology and innovation for the greater good. A nation mourns a great loss, along with Yameen’s family, his friends and all those closest to him. President Abdulla Yameen Abdul Gayoom today sent his condolences to Yameen Rasheed’s family, condemning the act of his murder. President Yameen has instructed all State agencies and his cabinet, and calls upon all independent institutions, to fully deploy their resources in bringing the perpetrators of this heinous act to justice. “We will not stand idly by while such acts of hatred are forced upon our citizens. I implore anyone with information, however little, to come forward to the authorities. We will deliver justice for the sake of Yameen’s family, his friends, his community and his entire nation.” said President Yameen.